It’s frightening that there are around 7.3 million burglaries in the UK every year. Though it’s one of the easiest crimes to prevent, breaking and entering is the most common. Many homeowners don’t notice how the smallest features can make their property truly desirable to burglars. They also don’t realise how simple the measures are that they can take to deter them! Burglars are tempted by homes that showcase their valuables, as well as those that look easy to get into. 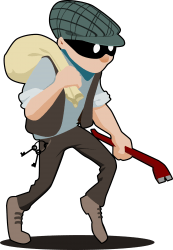 Homes that appear shabby and unkempt are often targets, as burglars expect the owners to be less vigilant with security. Owners that are lazy with shutting gates and garage doors may also be targeted – after all, if someone can’t be bothered to close a door, they’re very unlikely to lock another! The quality of your windows, doors and other glazed areas of your home can have a huge impact on its safety and security. Up to date installations aren’t only recommended for their aesthetics and energy efficiency, but also for strength and durability that can’t be matched by their weak, timeworn counterparts. Most people are active on Facebook, Twitter and other social channels, but not all of them are aware of the safety risks associated with social media use. It’s far too easy for strangers to see what you’re up to and where you live, even if you’ve activated strong privacy settings. All it takes is for one friend to leave their own social page logged in on a public computer, and your personal information will be there for everyone to see. Sometimes pets can be more of an encouragement that deterrent, as these homeowners are less likely to use an alarm system. Cat owners may also be prone to leaving downstairs windows unlocked, making it even easier for burglars to get inside. If you want your furry friend to have access to the outdoors, choose a high quality cat flap and make sure it’s installed properly into a strong, durable door. Cheap cat flaps and shoddy work will make your door weaker, and therefore easier to kick in. Gardens and yards can provide easy access and a quick escape route to intruders, while large trees, sheds and garages can also offer hiding places. Many people forget about their gardens when it comes to home safety, but these spaces also require some consideration. Making your home safe and secure is easier than you might think. By following these simple steps, you can safeguard your home against intruders and give yourself peace of mind, so you can relax and enjoy your summer, wherever in the world you may be! You can find out more about our high quality, secure windows and doors by exploring our range.